Retail sector growth estimate recorded the fastest growth rate of a business trend. After the evolution of retail technology, consumers confidence have reached a new height. The technology contributed mightily to that retail success, at every stage and angle of the shopping journey, both in brick-and-mortar stores and online, from check over the web, point-of-sale and shipping to checkout, supply chain, payments and much more. Heat Map Technology: This technology will provide you a detailed understanding of traffic throughout the store. It is important to know the flow of your customers at store, what products draw attention, which areas tend to be the most frequently visited, etc. can reveal where to focus your marketing efforts and design concepts. At CDN, we go through this technology before designing and developing a retail solution for our clients. Before building any solution, retailers need to know, what customers are buying and how they are shopping. So are you ready to harness the power of retail technology to increase your ROI? Contact us right now to discuss about your retail technology solution. Full Path Analysis: This technology will help you in knowing the full shopping trip of your customers. With the help of full path analysis, you can determine how each store’s layout, product selection, staff interaction, and pricing, affects overall sales. This technology uses video analysis to analyse the overall customer experience in your store. It also track engagement with displays. At CDN, we deliver latest technology solutions. If you are a retailer and need an innovative and ROI generating solution for your online or offline store, feel free to contact us here or you can also meet us in CeBIT Hannover 2017 at our stand A33 in Hall 002 to discuss about your solution in depth. 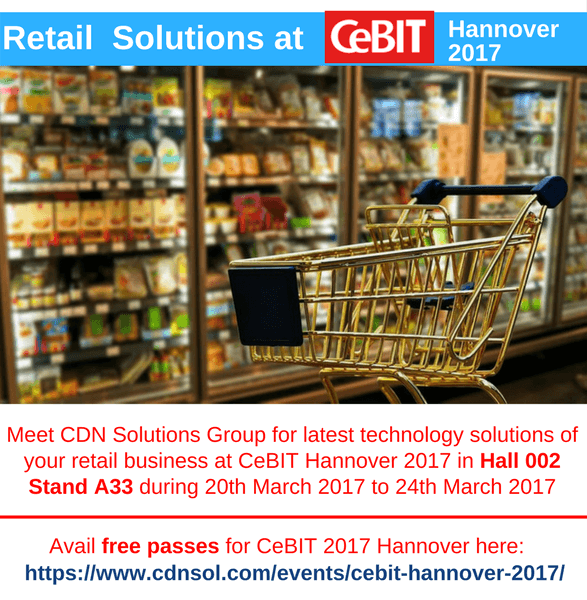 Avail free passes for CeBIT 2017 Hannover here. CDN Solutions Group is also flying to Netherlands, so if you reside there and have an idea popping up in your mind then our team will be more than happy to assist you.